There was a discussion over at The Online Photographer where they were talking about their difficulty of losing memory cards. This baffles me how anyone who takes their photography seriously would be so sloppy with things like the management of their memory cards. No offense intended but it makes me wonder how people work/live without having put much thought into how they want to regularly accomplish repetitive and important tasks. I am not the most OCD person by any stretch. I’m pretty loose with most things that frankly aren’t that important. My doG you will never see a photo of my insane desk or you will be certain that I’m a mental case. But when it comes to my photography I have attempted to have methods for everything that I do. It started with a column that the late great, and hugely inspirational to my budding photographer self, Galen Rowel wrote back in the middle 1980’s about how to work with these newfangled automated cameras. He talked about how different it was to go from his lovely all manual Nikon FM2 bodies to the then space age N8008 and F4. Remember them? All the buttons and functions and information in the viewfinder was confusing and overloading. Being also a pilot he likened the experience to the difference from flying Visual Flight Rules, VFR, to Instrument Flight Rules, IFR. VFR is when you have a nice clear day and you can see for miles and it’s just like, eh, taking walk at 20,000 feet. La-de da! What a nice day for a jaunt. VFR is when you can’t see where you are going and rather than looking out of the window you are watching all of your dials and gauges that tells you where you are, where you are going and what the conditions out there are like. A pilot under VFR can fly in total darkness, fog what have you and safely get to their destination without really seeing anything. But to do that you must learn to trust you instruments. One of the points in that column was that you need to know what instruments are important and when. Looking at all the information from all the instrument makes things harder. You need to know what to do and when to do it. He ended up saying that much of our new camera technology is lovely but always necessary. That it’s better to be an automated photographer who has important functions internally automated than to rely on external automation, the camera, to do the thinking. I totally got it. Galen was talking about training yourself to produce systems of thought and behavior to work subconsciously so that your active mind can focus on more important things like framing or anticipating the moment. From that I began on finding everything that I could about my photography, and frankly other elements of my life, that were repeating and find methods of making them efficient and then purely habitual. For instance, I don’t have to think about packing any of my bags when I head to a shoot as I always pack them the same way regardless of what I taking. All situations regardless of load out have a standardized packing scheme. You can give me one of my bags in total darkness and I can quickly find what I’m looking for. That’s 85mm or teleconverter or remote release is always in the same place. Thus mise en place. A chef spends time before service prepping everything that they need and putting each ingredient in a particular container in a particular place so that when an order comes in everything is ready and at hand. Shallots? Chopped and in this bowl here. Basil? Chiffonaded and right here. Squab? Cleaned, prepped and in the cooler at their knees. If they had to run around looking for stuff and chopping away to get things ready for your steak au poivre, you’d never get fed as the kitchen would be a tangled mess of panicked cooks. Maintaining my files, used to be film – again remember that?, is no different. Have a system, always do the same thing and you know what’s going on. Then you will never lose cards/files so long as you always do that above process. Use a labeler so that all of your cards have your contact info on them so that if you drop the card somewhere and it is found it can be connected to you. You should also do this with all your photo gear! With same labeler put a singular and incremental number of the card for reference. This is important in a number of ways. First if you are having issues with a card you can easily know that “card #4 is giving me problems and may need to be replaced”. Also if you have a long shoot that spans multiple cards you know which ones you have used. Always start the shoot with card #1. As a working pro I often come back from a days shooting having shot on 2+ bodies and created thousands of files that may span 6 or more cards. I don’t use huge cards because I don’t want to have a card failure and lose files that way. 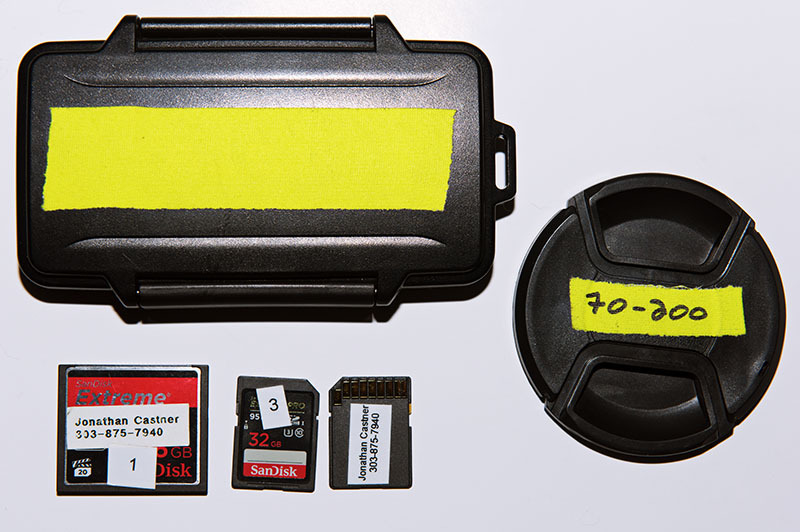 I often travel for multiple days of shooting and that could create files that easily span a dozen cards. If possible use cameras that have two card slots and set the camera to create backups on the second card. That is one less way to lose files but of course more cards to keep track of. But regardless have a method that works well and stick to it.